Vacation rental cabin / bungalow. Sleeps 24, 6 bedrooms, 5 bathrooms. Dogs allowed. Downstairs 2 king bedrooms - upstairs 3 queen bedrooms with another bedroom upstairs with a queen bed and a full bed. The loft area has 2 full beds and 3 full size lofa sofas. The inside kitchen is fully furnished and the outdoor kitchen is furnished with a sink, refrigerator and a charcoal grill. This home has a wood burning fireplace, pool and hot tub, pool table, game table with bumper pool and poker-flat screen TV’s with DVD player, DISH network, Jacuzzi tub, horseshoes, washers. Nice and safe place for vacation with family and friends. Naeem: It was so good having you at the Lost Moose Lodge. We are so very happy that you enjoyed your stay. Such a lovely and comfortable lodge with so many options for a large group to eat, sleep, talk, play and relax! We enjoyed the hot tub, the fire pit, the porch, the trails and all nearby attractions. So much for everyone to explore! 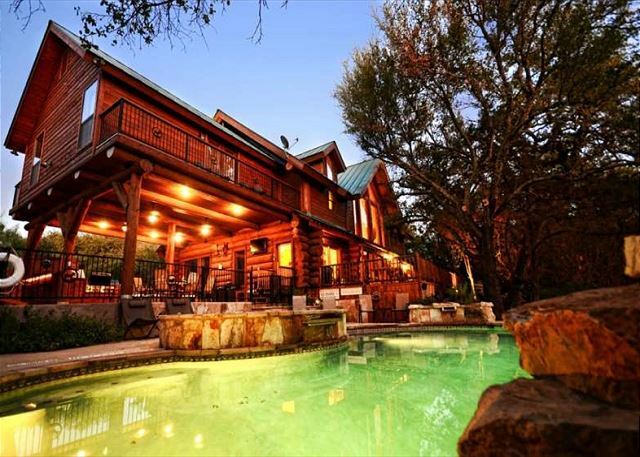 Lost Moose Lodge was a great place for our 5 couples to relax, spend time together and explore the Hill Country. And the staff at Log Country Cove were excellent to work with. We would definitely return again. Charles: Thank you for your kind comments and we here at Log Country Cove are so happy that you enjoyed your stay with us. We look forward to having you back with us again in the near future. Lost Moose Lodge was a great cabin for a large group. Plenty of space for everyone, lots of beds and great amenities. You may want to bring your own pillow (most were very flat) but beds were comfortable. Very pretty location and the property was very clean and well maintained. We had a problem with the wifi but called the office and they immediately sent someone out to help us. They even sent someone the next day to follow-up.